Our local gurdwara has spawned a nascent and energetic Sikh Women’s Association. Recently, they hosted a program to celebrate the life of Mata Sahib Kaur. For those on unfamiliar territory, Sahib Kaur, nee Sahib Devan, had a brief but telling part to play when the first amritceremony was held by Guru Gobind Rai in 1699. This event marked the beginning of the Khalsa institution. In a dramatic gesture, the Guru had demanded a head from the followers. After considerable reluctance, one man offered his head. 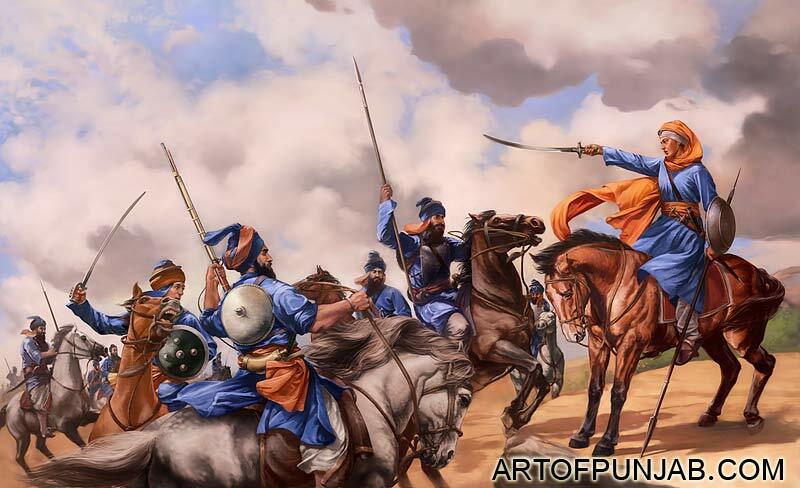 The Guru repeated his call, brandishing a blood-stained sword until he had five volunteers. He then appeared with the five, alive and well, nobly attired, and proclaimed them the first Khalsa. He then knelt before them and asked the Five to initiate him in turn. He then became Gobind Singh. From this dramatic beginning, a nation was created; these were the final touches to the message of Guru Nanak that matured under the tutelage of the nine Gurus that followed him. Gobind Singh was the tenth in that line. 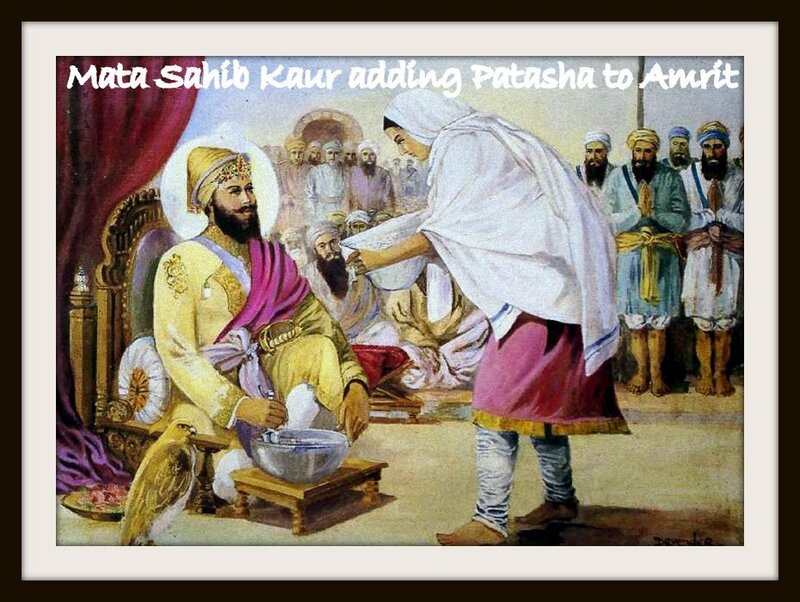 And, at this rite in 1699, Sahib Devan added sugar puffs (patashas) to the bowl of amrit. When I got the call to speak about her, sure enough, like any “ten o’clock scholar”, I hurried to my modest library for a spot of research. Can you imagine my surprise at the paucity of available information? The classic reference work in Punjabi on Sikhism – Bhai Kahan Singh Nabha’s Mahaan Kosh – carried barely a three-inch column on her. The other authoritative work, edited by Dr. Harbans Singh, the 4-volume Encyclopaedia of Sikhism in English, had just one column (half a page) entry. We have the names of her parents, but not her date of birth. The two sources even clash on when she appeared at Anandpur where the institution of the Khalsa was founded – in 1699 or 1700. If the later date is correct, as suggested by the Encyclopaedia, what does it do our belief that she added patashas to the amrit at the First Ceremony? She outlived Guru Gobind Singh, and communicated with the far-flung Sikh community via letters and directives. She died sometime between 1734, the date on her last missive to Sikhs, and 1747. A memorial to her stands at Bala Sahib Gurdwara in New Delhi. She may have spent her last years in Delhi, which was, at that time, under rulers absolutely and despotically against Sikhs. And that makes me wonder! My purpose here is not to cavil at historical details; it is to point out that every year we unfailingly honor this woman as the mother of the Khalsa, and yet her known bio is so skimpy. We all live and die. What lessons can we draw? How little do we know of our pioneering women? How do I look at her and others like her? The magic, the meaning and the measure of a life – indeed of history – are found not in the celebration of an individual or an event, but in the interpretation. History is a narrative. What does it tell us about the time that Guru Nanak trod this earth, particularly about the place of women? In the traditional Hindu society, scriptures were not open to women, female infanticide was not uncommon, and widow remarriage was not permitted. It was best for a widow to commit sati and perish by submitting to being burnt at the pyre of her dead husband. Society operated by the edicts of the Hindu law-giver, Manu. The essence of his teachings on women can be summarized in one sentence: a woman is subject to her father’s will before marriage, to her husband’s thereafter. There were only two major religions in India at that time: Hinduism and Islam. The lives of Muslim women were not much better, except that Islam was then the politically dominant religion in India. Yes, one can preach a message of gender equality, one can exhort people to think, and one can even legislate equal rights, but it is like taking a horse to water: there is no easy way to make it drink. To make reality of a recommendation or even of legislation requires a revolutionary change in the mindset. A cultural paradigm shift is necessary. Such a life-altering modification does not happen in an hour, a day, a year or even a lifetime. I offer some unrelated, but not irrelevant, examples to drive the point home. In the United States, women won the right to vote only in 1920, but now, 87 years later, we are still debating if the country is ready for a woman president. This country lived through the painful reality of a civil war in 1860, but a hundred years later in 1965, a voting rights bill was necessary. And racial discrimination still continues to fester. Obviously, the laws change many minds; that’s their intent and that’s why they are enacted. But many of us continue to cling to outmoded views. Nevertheless, Guru Nanak’s message did resonate with people. Under the tutelage of the third Guru, Amardas, the heinous custom of sati was rejected, widows remarried instead of being banished from life, and many women were appointed to positions of authority to preach the message of Nanak. But you should note that this occurred three generations after Guru Nanak. Paradigm shift occurs, but slowly and haltingly. Sikh history and culture have effectively sidelined and marginalized women. Look at how little we know of our pioneering women. Our culture also sidelines young people, but I save that for another time. We have effectively written young people and women out of our own history. I offer you another example, but from the time of Guru Gobind Singh, the Tenth Master. But what do we know of their intrepid leader, Mai Bhago? Not much more than the two lines I have penned here. Clearly, she was no ordinary housewife. She must have been adept at the use of weapons, excellent on horseback, and unmatched in leadership skills. The forty battle-hardened veterans would not have followed a lesser leader. And these are not skills that one can learn overnight. Mai Bhago’s story tells me that in the more than two centuries from Guru Nanak to Guru Gobind Singh, the roles of Sikh women had changed. They had become equal in many ways. There was a meritocracy at play here, not gender-determined destiny. Yet, what does history tell us about their personal stories? Close to zilch. And they lived nine generations after Guru Nanak, until the further liberation on the First Vaisakhi Day. When we read about the events of 1699, young people often ask why were there no women in the first Five who accepted the Guru’s challenge. And, why was no Guru a woman? History is a narrative rooted in culture and time. When we read history, we need to look at the events and the people, and judge them by the perceptions, not of today, but of the standards of that time and the values of that culture. Context is all-important. If the context is lost, the interpretation will not stand. History tells us that in 1699, heeding the Guru’s call, about 80,000 people came to Anandpur; surely many, if not almost half, must have been women. Surely, no public address sound system existed at that time; perhaps many women were busy with infants clambering all over them, and they never heard the call for a head. If 80,000 attendees had to be fed, who do you think prepared the langar? Even today, those cooking the langar in gurdwaras are predominantly women. Also, keep in mind that, in Indian/Punjabi culture, one assumption remains paramount, and you can easily see shades of it even today. It is that a woman will follow the religion, lifestyle and culture of the husband’s family. Such a pattern of expectation may have evolved from the need to preserve landholdings in a joint family, where the arable acreage determined economic well-being. Lives were such then. Things are different now, but our old habits are slow to shed. Progress is not always evident, and never is it linear. Look at the Durbar Sahib in Amritsar, the premier Sikh place of worship, where women may not sing the liturgy. Some years ago, a one-time exception was made for a group of visiting American converts to Sikhism. But the ban on women remains. I rest my case with one more example. Some months ago, in the middle of an unbearably hot summer, I had to make a quick one-week trip to India. I had not been to Amritsar for 28 years, and decided that this was a “must” stop. I reached there very late in the evening, at a time when the Guru Granth, ensconced in a palanquin, is ceremonially escorted to the adjoining building of the Akaal Takht for the night. People stand in long lines for the opportunity to participate in this service. Women are not allowed to do so. Tired as I was, unthinkingly I walked to the head of the line. The man in charge realized that I was perhaps ignorant of the ways, and invited me to put my shoulder to the palanquin. But then, I quickly saw a group of women standing quietly by the side. Always a little brash, I pointed out to the man that these women were waiting well before me, and deserved a chance. His answer was simple: “Women are not permitted to perform this service”. All I could do was politely say, “In that case, I would gratefully stand alongside them”. Thus, I declined the opportunity of a lifetime. What made the difference to me was that many women smiled approvingly at me, as did some men. A movement cannot progress, cannot flourish, if we leave half the people – women – out of the reckoning, and if their lives go unrecorded. But that is exactly what we have done. I look at Mata Sahib Devan, Mai Bhag Kaur, and innumerable others as mileposts in our slow and tortuous journey for human rights, equality in gender issues and justice. We tend to remember the people, and not the causes they lived for, or their lessons. And here we are today. The message was carried forward from Guru Nanak to Guru Gobind Singh. Have we been true to the message, or have we regressed? From every life, we need to draw some lessons. Mata Sahib Kaur, Mai Bhag Kaur, and many others – stalwart pioneers, all – who made Sikhism possible, were living, breathing women with full lives, not just adjuncts to men. In our historical narrative, we have reduced them to two-dimensional cardboard cutouts. Our pioneering women were important voices and a significant presence in our journey forward that was started by Guru Nanak, to create an egalitarian society without gender inequality. But look at the management of our institutions and activities therein; one cannot escape the conclusion that our women are the invisible half. Our onus is to see where we are now – at what point in that journey. The journey never ends. Mata Sahib Kaur’s story, like that of Mai Bhag Kaur and many others, is really every woman’s story.